What is an anticoagulation clinic? The Coumadin, or Anticoagulation Clinic, is a service of Memorial Hospital and Manor, established to monitor and manage the medication(s) that you take to prevent blood clots. 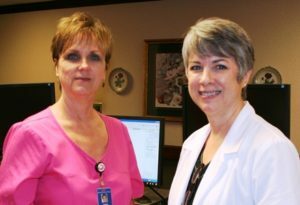 At Memorial Hospital and Manor, the Coumadin Clinic is located in the Kirbo Women’s Center and is staffed by a pharmacist and a registered nurse who have received special training in anticoagulation management. They work in conjunction with your physician to test your blood and adjust your dose of warfarin (Coumadin ® or Jantoven ®). They will monitor for possible effects of other medications that may interact with warfarin. Warfarin (Coumadin®), an oral blood thinner, has a very narrow therapeutic index, meaning that too much or too little can lead to serious consequences. As a result, this medication requires precise management, including periodic blood testing. Complications of oral anticoagulants are influenced by the patient’s age, diet and additional prescription medications, as well as over-the-counter medications. Why is a special clinic needed to manage my medicine? Warfarin (Coumadin®) is a prescribed blood thinner designed to prevent development (or redevelopment ) of blood clots in patients with certain medical conditions or trauma. When patients take Coumadin®, monthly monitoring is required to ensure that the appropriate therapeutic doses are taken. While on warfarin, your blood clotting time or INR must be checked at least once a month, but more often when first starting this medicine, when changes are made to your other medications, or if your INR results are not within the therapeutic range. If you have any questions, please don’t hesitate to contact the Memorial Hospital and Manor Coumadin Clinic at (229) 243-6100, Ext. 541. What is required to be enrolled in the Memorial Hospital and Manor anticoagulation clinic? Your physician must send a referral order to the Coumadin Clinic office. This physician must be someone whom you intend to visit at least once a year. You must be willing to come for the required appointments with the pharmacist or R.N. at least once a month, and more often if necessary. What is the procedure for follow-up in the anticoagulation clinic? After your physician sends in the referral order, you will be contacted by the Coumadin Clinic staff to discuss your therapy and to arrange your first appointment. 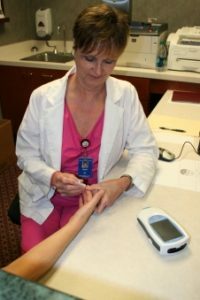 At your appointments, the pharmacist or nurse will check your INR by using a fingerstick blood test (the result will be available immediately). The pharmacist or nurse will ask some questions about your health and medications, determine if your warfarin dose should be adjusted, and schedule your next appointment. At your first visit, you will be given some additional education regarding Warfarin (Coumadin®). Appointments may be made by calling the Coumadin Clinic office at: 229-243-6100, Ext. 541. The Clinic is open Monday – Thursday, from 7:30 a.m. to 4:00 p.m. The Clinic is closed on Fridays. Appointments usually last 10 -15 minutes. Initial visits usually take 15 – 30 minutes.